In the end, it was worth the wait. 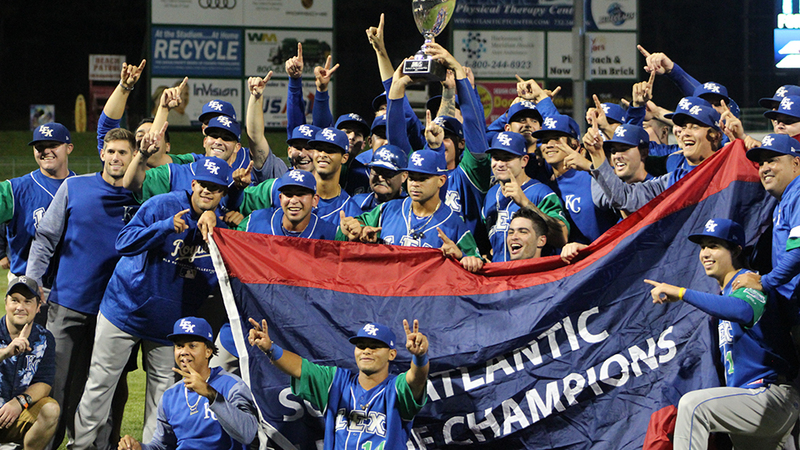 It took until the ninth inning for Lexington to score the go-ahead run, but Cristian Perez's sacrifice fly gave the Legends a 2-1 victory over the Lakewood on Friday at FirstEnergy Park and their first South Atlantic League championship since 2001. The best-of-5 Championship Series was tight throughout, helping Lexington prepare for Friday's nail-biter. "They earned it," Legends manager Scott Thorman said. "The guys are pretty excited, they played great all season and really came together down the stretch. Lakewood had a heck of a team as well and they gave us a run for our money. It was a great series." With the score tied, 1-1, Royals No. 21 prospect Brewer Hicklen drew a leadoff walk in the ninth. Manny Olloque sent him to third on a single to center field and Perez followed with a fly ball to right that was deep enough to score Hicklen. "It was pretty exciting," Thorman said. "We've played these guys tough all year. It's been close games every game we've played against them, so we weren't surprised by another close game. Fortunately, we were able to put another run across the board in the ninth with a big RBI from Perez. These guys really stepped up." Thorman brought on closer Tad Ratliff to pitch the bottom of the ninth, but Rodolfo Duran led off with a single to center. Two outs later, Colby Fitch singled and Dalton Guthrie kept the BlueClaws alive when his ground ball caromed off Ratliff for another base hit. The right-hander, who saved all three wins in the Championship Series, got Jose Antequera to hit a roller to Carlos Diaz, who stepped on third to set off the celebration. "It was exciting to watch," Thorman said. "Ratliff nailed it down for his third save of the series. He's been excellent for us all season and has had an unbelievable year, and he continues to do what he has the ability to do, which is to close out games. He's been doing it all year and once again he put the game away for us." The Legends jumped out to a 1-0 lead in the fifth when Perez doubled home Olloque. Lakewood tied it an inning later when Phillies No. 7 prospect Jhailyn Ortiz lined a two-out single to right to score 30th-ranked Simon Muzziotti. The BlueClaws nearly took the lead, but Jake Scheiner was nailed at the plate by right fielder Cal Jones. It was just the break the Legends needed as they took the series, 3-1, for the second championship in team history. "It's really nice for these young players," Thorman said. "They really came together down the stretch, and they didn't panic tonight. It was something new every night for these kids. These guys really put together a nice series and got all the big hits when we needed them." Marisa Ingemi is a contributor to MiLB.com. Follow her on Twitter @Marisa_Ingemi. This story was not subject to the approval of the National Association of Professional Baseball Leagues or its clubs.